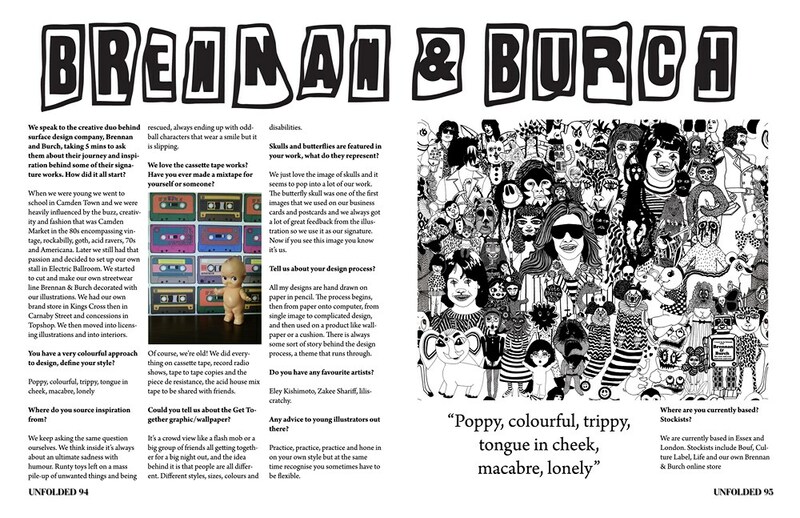 We speak to the creative duo behind surface design company, Brennan and Burch, taking 5 mins to ask them about their journey and inspiration behind some of their signature works. How did it all start? When we were young we went to school in Camden Town and we were heavily influenced by the buzz, creativity and fashion that was Camden Market in the 80s encompassing vintage, rockabilly, goth, acid ravers, 70s and Americana. Later we still had that passion and decided to set up our own stall in Electric Ballroom. We started to cut and make our own streetwear line Brennan & Burch decorated with our illustrations. We had our own brand store in Kings Cross then in Carnaby Street and concessions in Topshop. We then moved into licensing illustrations and into interiors. You have a very colourful approach to design, define your style? Where do you source inspiration from? We keep asking the same question ourselves. We think inside it’s always about an ultimate sadness with humour. Runty toys left on a mass pile-up of unwanted things and being rescued, always ending up with oddball characters that wear a smile but it is slipping. We love the cassette tape works? Have you ever made a mixtape for yourself or someone? Of course, we’re old! We did everything on cassette tape, record radio shows, tape to tape copies and the piece de resistance, the acid house mix tape to be shared with friends. Could you tell us about the Get Together graphic/wallpaper? It’s a crowd view like a flash mob or a big group of friends all getting together for a big night out, and the idea behind it is that people are all different. Different styles, sizes, colours and disabilities. 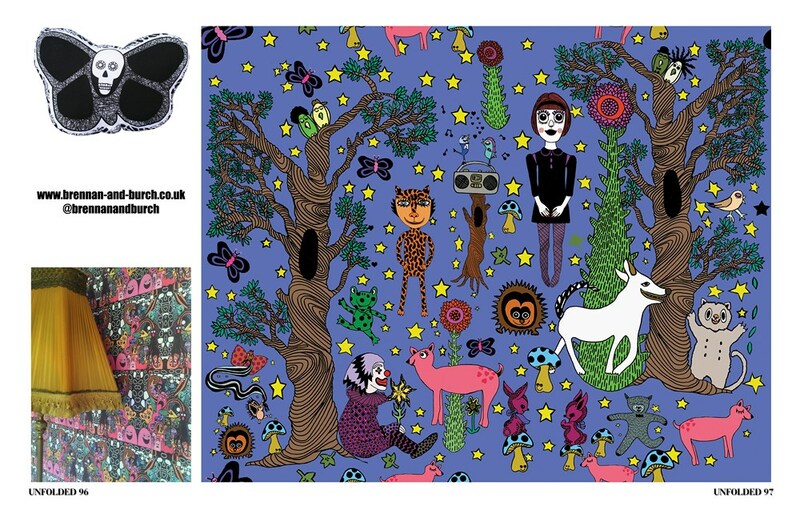 Skulls and butterflies are featured in your work, what do they represent? We just love the image of skulls and it seems to pop into a lot of our work. The butterfly skull was one of the first images that we used on our business cards and postcards and we always got a lot of great feedback from the illustration so we use it as our signature. Now if you see this image you know it’s us. Tell us about your design process? All my designs are hand drawn on paper in pencil. The process begins, then from paper onto computer, from single image to complicated design, and then used on a product like wallpaper or a cushion. There is always some sort of story behind the design process, a theme that runs through. Eley Kishimoto, Zakee Shariff, liliscratchy. Any advice to young illustrators out there? Practice, practice, practice and hone in on your own style but at the same time recognise you sometimes have to be flexible. Where are you currently based? Stockists? Photographer and Journalist specialising in art and fashion. Former editor of Unfolded Magazine.